Il Binson began it’s life as a Binson HiFi 20 amplifier. When it arrived at Rerun it was in a very poor condition– the output transformer was blown, the speaker was destroyed, and it had numerous cosmetic problems including a ripped grille cloth. As Zach was looking for something with a bit more power than the original offered anyhow, we decided to go for bigger output tubes as well as installing a reverb and tremolo. Although Italians are famous for their temperamental behavior, this amp really fought the changes in a dramatic fashion! Probably the most important change was removing a large section of the back panel to create a better airflow — the new KT77s are cathode biased which means they run hot. 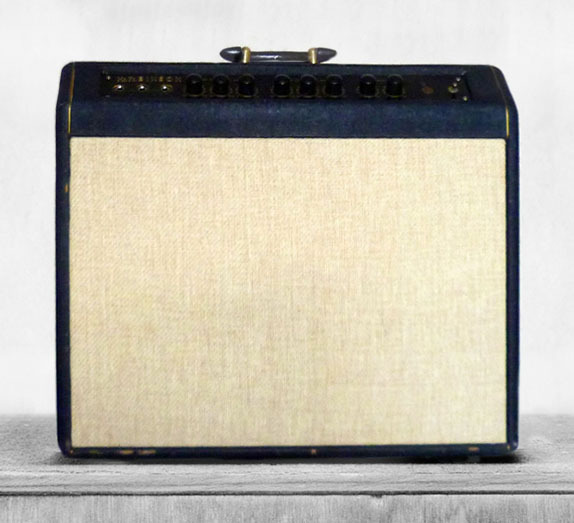 Other difficulties included finding a good spot in the small cabinet for the reverb tank, and working out a tremolo circuit that was slow and deep enough without robbing too much of the natural sound and volume. All in all, this is a great size and sound, definitely vintage with some modern touches.